You’ll often hear people who like watches talk wistfully about the golden age of watch design. Give or take a few years, that fell between 1950 and 1970. It spawned some of the most beautiful watches ever made – and led to one of the industry’s most fruitful periods at the cash register. So good were the best of that period that the Swiss are still making them today. Of that generation, some are lionised above all others. Rolex’s Submariner (1953), Omega’s Speedmaster (1957) and TAG Heuer’s Carrera (1963) spring to mind. 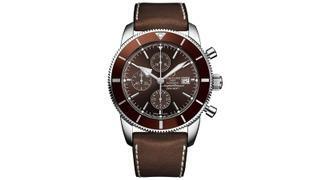 Breitling has a couple, too. Its 1952 Navitimer was a calculator for the wrist and became a flyboy go-to. And then there was the Superocean. Introduced in 1957, it has lived in the shadows of the Navitimer, but many watch aficionados consider the two of equal importance. For starters, the Superocean played a pivotal role in popularising a category of watches we now take for granted – the diver’s watch. Nowadays, diver’s watches are fashionable accoutrements first and tools second, deployed primarily as promises of masculinity. But the Superocean and its ilk were made for purpose, and in direct response to the growing popularity of diving. Water resistant watches were developed with rotating bezels with minute scales on them that, when aligned to the watch’s minute hand, became countdown devices. Breitling’s original Superocean boasted water resistance of 200 metres (Rolex’s original Submariner could manage only 100 metres). Over the past six decades, the Superocean has evolved and there have been many versions of it. 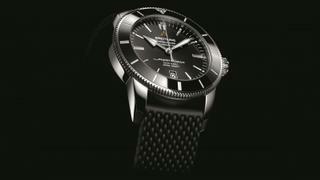 In 2007, Breitling brought out the Superocean Héritage. A decade on from that, Breitling has breathed new life into it again, introducing time and date only models of 42mm and 46mm, and a 46mm chronograph piece, all with a nod to the design’s 60th anniversary. The bezel inserts are now made of scratch and fade resistant ceramic and the movements come with power reserves of 70 hours and more, as well as chronometer certification for accuracy. As per the 1950s original, though, they’re also available on stainless steel mesh bracelets (chic, versatile, superyacht-approved), and they’re all water resistant to 200 metres. The Superocean lives on. As it should. It’s a staunch piece of design that, like so many from the golden age that bore it, remains resilient to the whims of changing fashions.